How to create a Lesson using the Free Text with Feedback Component? 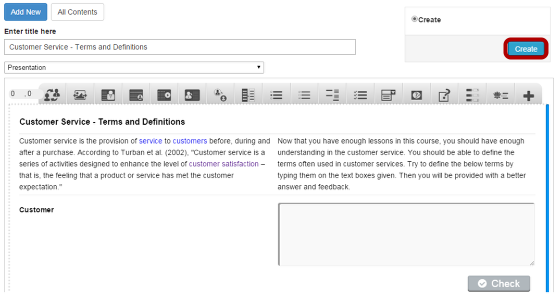 Using this component, you can ask a question and enable the user to enter the answer in the text field provided. Then, you can give the user some feedback and a better answer for the question. You can use this component whenever you want to ask questions to the users and give some feedbacks for user's answers. You can use this component whenever there can be various answers for a question. The descriptions and instructions are placed on the top left and top right sides on the page. The question can be found below the descriptions. The user types the answer for the provided question in the text field opposite to the question. He/she clicks the Check button. A more effective answer and feedback are displayed. If there are more questions, the user can click on the ‘Next’ button to see the next question. The user can navigate between the questions using the ‘Next’ and ‘Previous’ buttons and repeat step 2 to 5. You can place an optional title for the page. The Description Right field is optional. The texts can have bulleted points, hyperlinks etc. Click on the Free Text with Feedback component icon as shown in the above image. You will see a screen similar to the image shown below. Add the description texts on the Description Left  and Description Right  fields. Add a question in Question Text  field under Questions title which is under the Available Questions title again. 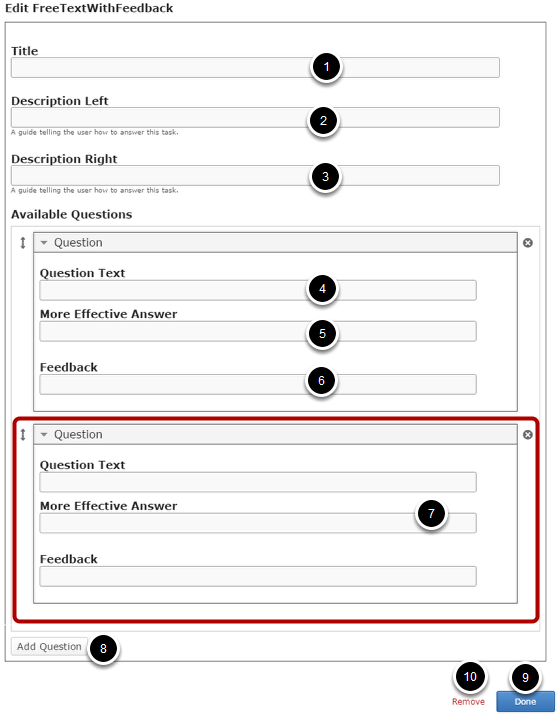 Add texts to the More Effective Answer  and Feedback  fields. Add another Question, More Effective Answer and Feedback in the respective fields . Click the Done  button to save the changes. Just type the contents of the page in the Description Left field as shown in the above image. You can also change the format of the text, add and remove hyperlinks and insert horizontal lines between the contents. This field is mandatory and must have some text in it. 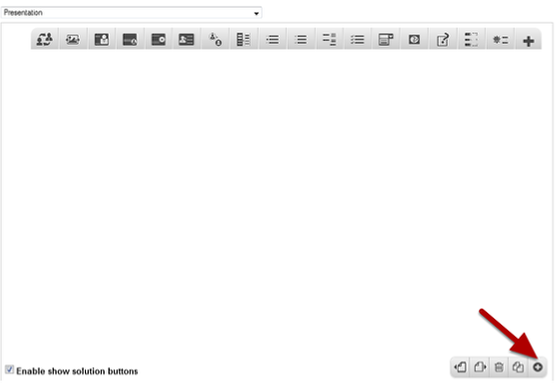 Similarly, you can add contents to the Description Right field as shown in the above image. You can also change the format of the text, add and remove hyperlinks and insert horizontal lines between the contents. Please note that this field is not mandatory. Start entering the question in the Question Text field. You can also change the format of the text, add and remove hyperlinks and insert horizontal lines between the contents. Please note that this field is mandatory. Under Available Questions, we can add a more effective answer to this question. Start entering the answers in the More Effective Answer field. You can also change the format of the text, add and remove hyperlinks and insert horizontal lines between the contents. Please note that this field is mandatory. 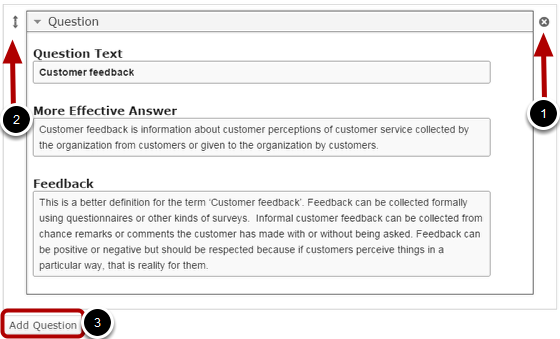 Type the contents of the Feedback field as shown in the above image. You can also change the format of the text, add and remove hyperlinks and insert horizontal lines between the contents. Please note that this field is mandatory. By default, there are only two Questions available at the beginning. If you want to add another one, click the Add Question  button as shown in the below image. Another Question will be added after you click the Add Question button. You can remove any question by clicking the X  button on the top right corner of the Option window. You can also change the order of the questions by dragging the Double Headed Arrow  button on the top left corner of the Option window. Similarly, you can add as many questions as you want. You can as many as questions in a page using this component. You will be able to navigate between the questions using the ‘Next’ and ‘Previous’ buttons. The navigation buttons appear only when there are more than 1 questions. There is no Retry button for this component. The answer entered by the user is never compared to the correct answer. The user just enters his/her own answer, and we provide a better answer and feedback.